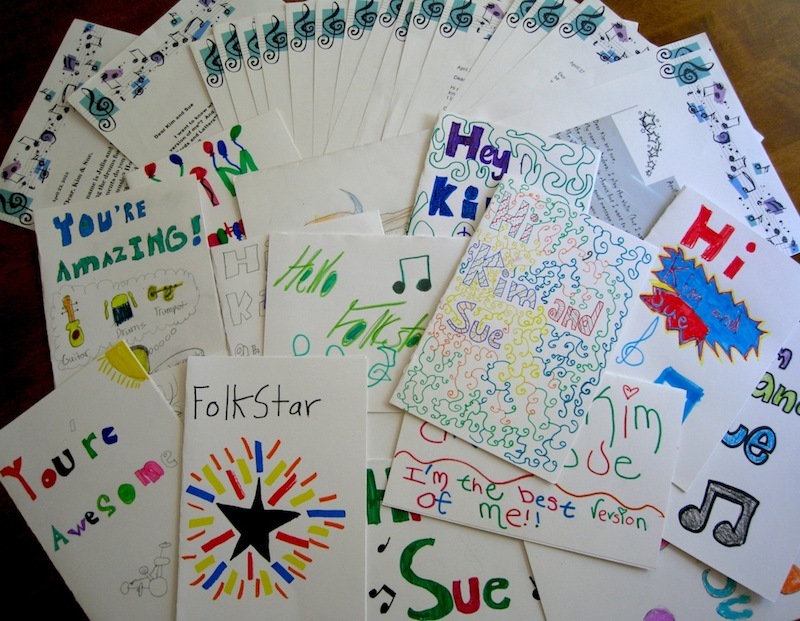 In addition to being delightfully meta, receiving some really creative cards and letters from sixth graders about our song “Cards and Letters” made us feel just plain good. These awesome students in Connecticut (where I’m from) watched our video and discussed it in class, then posed some well-thought out questions in addition to crafting some very nice cards. They drew some of our favorite things, including stars, musical instruments, music notes, and, of course, cats. How did you know about our undying love for these things, Shepherd Glen? Sue and I wrote them letters in return, which we had to resist the urge to deliver personally (what?…11+ hours isn’t THAT long of a drive). We hope you like them and continue to like us, Shepherd Glen. 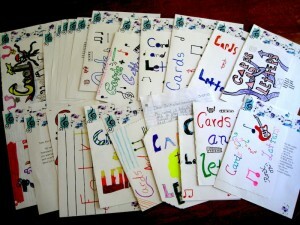 Emails and Facebook “Likes” and comments are nice, but nothing compares to good old fashioned snail mail. Ah, nostalgia. We are always grateful to our fans who express their love in all forms and do our best to make sure you feel our love and gratitude in return. So keep sending us letters, hit “Like“, Tweet, post your own video responses to our videos, and just continue being creative and awesome. Speaking of creative and awesome, we’ll be posting information about the album release date very soon. We can’t wait! Congratulations on playing saxophone. That’s a hard instrument to play! Well, the inspiration came from people putting pressure on about not being what they want us to be. We all have people (parents, teachers, and friends) who pressure us to be a certain way or don’t understand that we like different things than they do. The song is about feeling like you’re not the person others want you to be and struggling with the feeling of not being good enough. In the end though, we’re unique individuals, happy being who we are, and we’re the best we can possibly be (“the best version of me”). Thank you for the inspirational words “Keep writing unique music and singing about things you love.” That means a lot to us. Hmm… That’s tough to answer precisely. Each song is different, but for “Cards and Letters” the lyrics came first and they were written pretty quickly. Then Kim came up with a rough version of the song on acoustic guitar. Then we decided the exact structure of the song. For this song the biggest choice was deciding if it should end with the chorus or if it should end differently. We chose the second option and ended the song with “I’m the best version of me.” After that, Sue spent several days writing the electric guitar, bass guitar, and drum parts. So, for a rough copy of the song, it didn’t take very long, but to complete the song it a while. Also, it took months to do the actual recording of the song. Thanks also for writing that you hope we write many more songs. We definitely will!! Thank you for your extremely well-written letter! Congratulations on playing violin and singing in your chorus as well. We’re very happy that you liked the song and the video, and especially that you pointed out that the lyrics meant something. A lot of songs on the radio these days don’t have much meaning and we like to try to change that. You asked us how long we’ve been in a band and if we’ve gone on tour. We’ve created Folkstar two years ago, in 2011. We’re currently working on going on tour, but it’s tough to get everything set up. Wish us luck! Thanks for your letter. It meant a lot to us that you wrote: “You’re an inspiration and I want to follow in your footsteps.” Thank you for saying that! Well, we both did. For a long time we tried to think of a name that best described us. Kim plays more folk style music while Sue typically likes rock music, like a rockstar. We finally combined these two ideas and together we became Folkstar. Get it? Folk and rockstar?Thanks again for your letter and keep playing violin and start on those drums too! Thanks for both your card and your letter. Nice drawing on the front of your card! Well, it was super exciting! We were both just plain giddy! Sue played air guitar to her own solo! You also asked us if we liked cartoons. Well, Sue loves graphic novels, which are basically cartoons for adults. She also reads a ton of regular books too. Both of our musical interests started when we were kids, around 8 years old or so. We both had musical influences in our families as well as in the world around us, and we were drawn to it like magnets. We were just meant to be musicians. Thanks again for your letter and we’ll be sure to keep writing and singing songs! Congratulations on playing the trombone. It’s such an interesting instrument! Kim likes a lot of singer-songwriter type music, as well as folk music and acoustic music, and a lot of other types too, such as pop and rock. Sue tends to like harder music more, like rock n roll, with strong voices and loud guitars. Thanks again for your letter! Thanks for your letter and congratulations on playing drums and singing! Sue started writing her own lyrics and music when she was 14 years old, but none of it was very good! She writes really well now though so she’s happy about that. Kim started writing music at 10 years old, when she wrote and played a song for a friend who was moving away, and she hasn’t stopped since! Thank you for writing that you thought our songs and video was amazing. It means a lot to us! Thank you for your colorful card with all the “cool” drawings on it as well as your letter, and congratulations on playing the drums, violin, and singing in the chorus! Sue’s first instrument was acoustic guitar. She didn’t want to play acoustic guitar though; she wanted to play electric guitar, but her parents refused. They told her that she had to play acoustic guitar or no guitar at all. Years went by and Sue was so desperate to play guitar that she started playing a terrible, beat up old acoustic. But once her parents saw how serious she was about playing guitar, they allowed her to finally play the electric guitar. Believe it or not, Kim’s first instrument was the trumpet. Everyone thinks her first instrument must have been the acoustic guitar because that’s what she plays mainly today. But nope, she first learned the trumpet and she was very good at it. She just started playing her trumpet again, and we recorded a new song with a trumpet solo in it. Thanks again for your card and your letter! Thanks also for writing “good luck with your music.” We appreciate it!! ← The master is here!